Birds fly south for the winter, but Monterey County, California, beckons travelers to head west. The region, with its mild year-round climate, is promoting itself as a "winter getaway for couples," featuring romantic B&Bs, award-winning wineries, outdoor nature activities, and spectacular Pacific Coast scenery. Situated on California's Central Coast, Monterey County includes Big Sur to the south and the picturesque communities of Monterey, Pacific Grove, and Carmel By The Sea on the Monterey Peninsula, which juts into the Pacific Ocean. The famous Pebble Beach Golf Links is on the southern end of the peninsula, the site of many famous golf tournaments that draws both celebrities and professional golfers. Jessica Keener, spokeswoman for the Monterey County Convention and Visitors Bureau, says wintertime visitors will avoid the crowds and might enjoy staying in one of the B&Bs in Pacific Grove. She says the Centrella Inn provides romantic accommodations and is conveniently located near other attractions. "The location is great because you're just steps away from Lighthouse Avenue, which is in downtown Pacific Grove, where there are antique shops and restaurants, and you're also close to Lover's Point and the coast," Keener told ConsumerAffairs. Lover's Point is a four-acre park used for picnicking, fishing, swimming, water sports, and surfing. It also provides a nice view of the ocean. 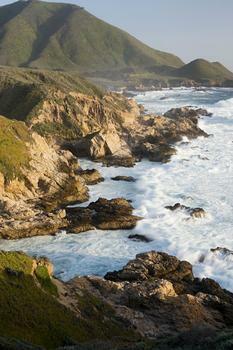 In fact, a big part of Monterey County's attraction is the view of the rugged coastline and the Pacific Ocean. Restaurants strategically located to provide those views tend to be popular dining spots. For breakfast, Keener recommends the California Market at Pacific's Edge, at Carmel Highlands. "I like to have one of their breakfast dishes on their 1,200 square foot deck overlooking the Pacific Ocean," she said. For lunch, Keener suggests heading down to Big Sur to dine at Nepenthe. She recommends their signature ambrosia burger. For dinner, Keener is fond of The Beach House at Lover's Point, in Pacific Grove. "It has a nice view of Monterey Bay where you can watch the sunset from their massive windows," she said. Diners are also likely to catch sight of the hundreds of sea lions and sea otters that seem to be everywhere along the coast. If you take a ride on a whale-watching cruise, you are likely to spy much larger sea creatures. This week, one whale watching boat reported spotting more than 60 blue whales off the Monterey County coast. Monterey County also lies in the heart of one of California's most prolific wine-growing regions. A three-day tour will allow visitors to experience the tasting rooms of River Road, the country charm of Carmel Valley, and the coastal views of Monterey and Carmel. Monterey County has been a backdrop in literature and motion pictures. John Steinbeck's novel "Cannery Row" is set in Monterey County, and to honor the writer, Keener says a street was renamed Cannery Row in the 1950s. Today, Cannery Row is lined with shops and restaurants and is one of Monterey's biggest attractions. The area's year-round moderate climate and spectacular views has also drawn Hollywood over the years, with many famous directors choosing Monterey as a location to film. "From Here To Eternity" was produced there in 1953, with Burt Lancaster and Deborah Kerr's famous kissing scene filmed in the surf of Big Sur instead of Hawaii. Monterey County Regional Airport has connections to Los Angeles, San Francisco, and other western cities. Travelers might find cheaper fares by flying to San Francisco, renting a car, and enjoying the two-hour drive along scenic Highway 1, which hugs the Pacific coastline from the Bay Area to Monterey County.